I have to do something, even if it’s a handmade card or a flower on the bench. 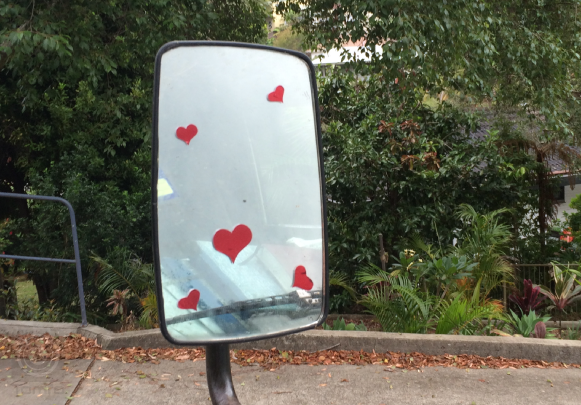 Last night I ducked outside and stuck a few heart stickers on the door handles and both mirrors on my husbands truck, just for fun. The next door neighbours saw me doing that and all the kids kept riding their bikes over to check out how many I was putting on there. We all laughed and threw the ball for the dog, then the boys took a drive up the driveway to load the truck up for the day. Not a bad way to start the morning. I remember our first Valentines day about 10 years ago, we headed to the beach and had our favourite hamburger, I set the rules way back then, so I can’t complain about lack of flowers or abundant, expensive gifts. But then, I did marry a landscaper, who you think would have access to a large array of flowers or even branches that could be bought home by way of a romantic guesture. we both laughed and I mentioned that I’d pick up some schnitzel for dinner tonight. I was on the phone to mum and said, “Oh look, I think it’s an expensive valentines day present coming up the drive”… nope, it was just a box with some pesticide in it. but we do have schnitzel for dinner tonight! We’ll have a wine/beer and make our favourite meal, have a discussion about what happened today at kindy and perhaps watch a movie later on. What’s your favourite valentines day memory?